National women’s rugby sevens side Kenya Lionesses will face Argentina in the Main Cup Quarters of the Hong Kong Sevens after finishing top of Group A on Thursday with a 100 percent record. National women’s rugby sevens side Kenya Lionesses will face Argentina in the Main Cup Quarters of the Hong Kong Sevens after finishing top of Group A on Thursday with a 100 percent record. The Lionesses won all its matches including a first ever against South Africa in the final game. Kevin Wambua’s girls kicked off the day with a 17-5 win over Papua New Guinea before going on to crush Mexico 40-0. The most significant victory of the day came with a well executed 24-12 victory over South Africa. Janet Okello and Sinaida Aura scored two tries each, two of which were converted as the Kenyans ran over the South African girls who beat them to the African title last year. Kenya had a perfect start, Aura showing a clean pair of heels on the left to leave her markers and finish off with a remarkable try under the posts. Doreen Remour’s effort from the conversion hit the posts as the Lionesses took a 5-0 lead. The South Africans responded through Eloise Webb who took advantage of a small gap in defense to quickly dot down after they earned a penalty. However, Kenya ensured they went to the break noses up with Okello dotting down with superb pace once again through the middle after her trick footwork left her markers for dead. Remour added in the extras for a 12-5 half time lead. After the break, Aura dotted her second with some unmatched pace on the right after Kenya had turned over possession and quickly played the ball wide. Janet Awino’s conversion was good, Lionesses leading 19-5. Okello put the game beyond the African rivals with some good show of footwork once again, dotting down under the posts. Veroeshka Grain dotted down a late consolation for South Africa after beating the Kenyan backline for pace racing in to bump down a kick from Webb. 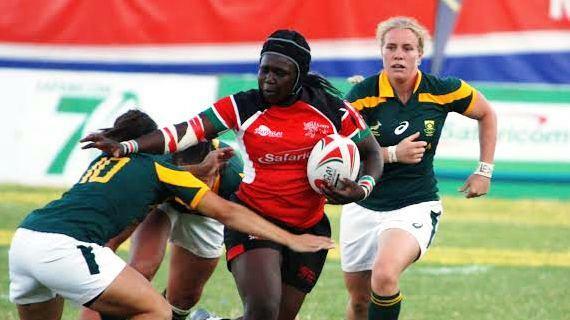 Against Papua New Guinea, Sheila Chajira dotted down Kenya’s first try of the match after settling down early. Janet Awino added in the extras for a 7-0 lead. Papua New Guinea responded with an unconverted try after the break but were soon down to six after losing a player to the sin bin for a high tackle. The Lionesses made the most of the two-minute numerical advantage crossing over the chalk with two unconverted tries from Remour and captain Philadelphia Olando to secure the result for Kenya. In the second match, Wambua’s girls were in devastating mode, Chajira and Celestine Masinde striking a brace each with Kenya landing six tries, five of which were converted.